Today I am sharing one of my absolute favorite recipes. 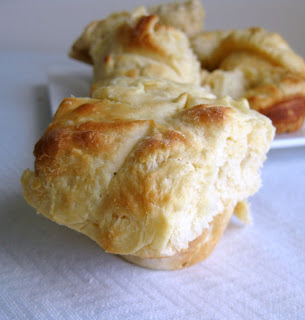 Butterflake Rolls. I first made these for Christmas dinner this year, and although a bit labor intensive, they are some of the best rolls I have ever had, heck they are one of the best foods I have ever had. 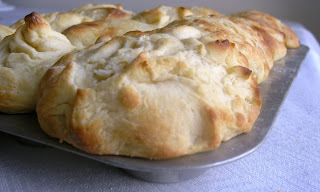 Flaky, yeasty bread, layers of butter and a melt in your mouth texture. This recipe makes a large batch but they are easy to freeze and defrost later. The amount of flour that goes into these will really depend on the climate you're in. If it is a humid day you will need to add more, if it is a dry day, less. The trick is to add enough so that the dough doesn't stick to everything. I do it little by little and when I can poke the dough and it doesn't stick to my fingers, I figure that it's enough (a little trick my older sis taught me). I also vary the number of layers depending on how buttery I want them, so feel free to play around with the recipe and find what works for you. That's part of the fun of cooking, right? Taking a recipe and making it your own. I hope you all love these as much as me and my family do, and have a beautiful day! Dissolve yeast in lukewarm water, set aside. 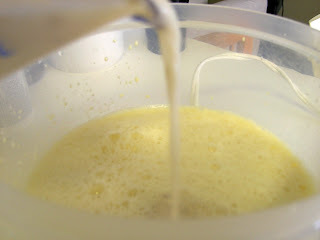 Beat eggs with a mixer until fluffy, add sugar, salt, milk and hot water. 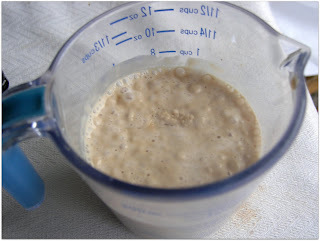 Add yeast mixture. Slowly add up to 5 cups of the flour (if it is too goopy to form a dough, add more flour until it is wet, but workable). 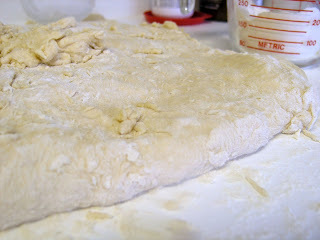 Turn out on floured board (or oiled counter top) and knead in the remaining flour (be sure to flour your hands first!). 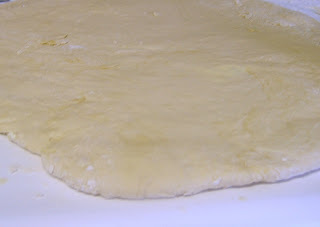 Knead gently, keeping dough light, add more flour as needed to create a wet but not sticky dough. 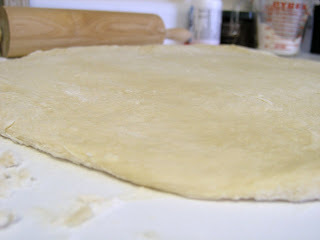 Using a floured rolling pin, roll out to about 1/2 inch thickness. Using your hands, spread dough with soft butter (like I said, however much you would like, for me more butter is always better so I use about two tablespoons). Cut dough in half and stack together. 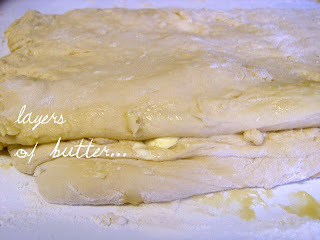 Roll again, adding more soft butter as needed on each layer. Do this several times (I do this four times, cause I like butter). On final time roll out until 3/4 inch thick. Cut in circles, using a small glass about 2 inches across. The dough should be quite light. 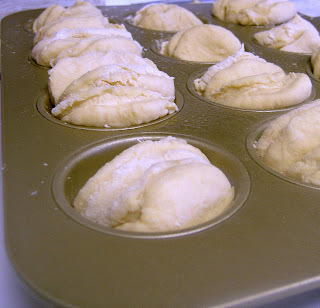 Place each circle of cut layered dough on its side in a muffin tin cup. 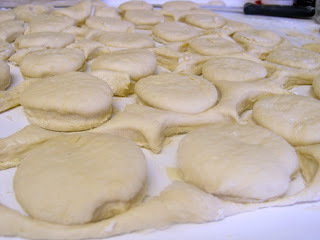 Cover dough with a damp towel and set aside to rise for two or three hours, until nicely puffed up. When ready to bake, brush tops of rolls with more butter, a pastry brush works well here. Bake at 375º for 8 to 10 minutes. Makes about 4 dozen rolls. I would love to know some of your favorite recipes! If you have a link to one of em feel free to leave it in the comment section and I will check it out. Lovely! I adore the shape. These look delicious too! And so pretty. Those rolls look simply delicious. And your Valentine's cookie pie looked INcredible. I believe I've been dreaming of it ever since I saw it last week. They look scrumptious and amazing! Yum! Sigh, you're making me fat(ter)! Love your recipes! 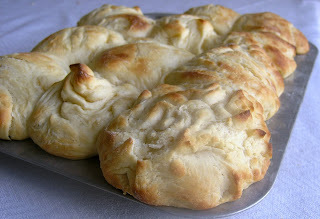 Oh my, those do look so flaky and good. These would make any dinner special. The buttering and stacking technique must produce an incredibly light and flakey roll. These would be perfect with soup or salad. A nice slab of butter and I am a goner! Wow, these look good! I make a lot of our bread and there are some interesting ingredients in that recipe. I cannot wait to try these! Oh Liz,these are just beautiful butterflake rolls. They look so good and I can't wait to try them. Thank you so much for sharing them with us today at Full Plate Thursday. You have a great week end and please come back! Those look so amazing. I'll have to try them. Stopping by from Full Plate Thursday to say hello! These look wonderful. Your recipes are amazing! I must admit, I'm not much of a cook, but your recipes inspire me to hang out in the kitchen a little more often. Thanks for linking up to the It's a Keeper Thursday blog hop! I hope you come back this Thursday and link something new! 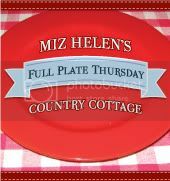 Congratulations you are featured on Full Plate Thursday this week 2-10-11. You can stop by and pick up your Red Plate. Hi! I found you on It's a Keeper, and am now following. I'm seriously hungry after reading your roll recipe. They look yummy! Hi! I'm featuring your recipe/project on It's a Keeper Thursday this week! I’d love if you stopped by and grabbed a button. Oh my heaven's these look amazing! I will be trying these very soon! I'm making these for Thanksgiving, and am trying to figure out how much I can prep ahead of time. You say these rolls can be frozen: do you freeze them before baking or after? If before, do you thaw them first or bake from frozen? If after, do you thaw in fridge and then reheat in oven? Let me know! Thanks!